What Modern Floor Lamp we’ve saved for you today? Let’s find out! Hey you! Welcome back! Today is Inspirational Day, we’re going to talk about a new Modern Floor Lamp. You want to know? Stay with us! 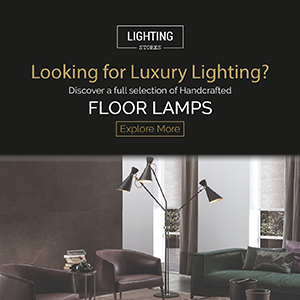 Tom Dixon Lighting is one of the most important lighting design stores. In here you can find different types of lighting, floor, suspension among others. You can find out lighting and furniture with the utmost luxurious finishes, but at the same time the most simpler light. Tom Dixon, didn’t know what career he would follow, he discovered his passion when he was fixing up old motorbikes in his free time. He has a unique style of performance and open-minded experimentation, these two factors have opened the doors for Tom Dixon to enter the international design scene. Back in 1987 he opened his own manufactory Dixon PID, which later became known as Space. Tom Dixon reinterprets solid industrial design with a modern-glamorous style by combining non usual materials – cast iron with a brass lampshade or marble tabletop. Despite the eccentricity, Tom Dixon can be relied on for rock-solid manufacturing, often even with traditional craftsmanship by hand. What do you think about this ones? It is clear that this modern floor chandelier have a unique style. A total mixture of modernity, class and glamour, this is definitely a good Modern Lamp to have in your home. A robust floor standing light made of brass. The Base collection combines a smooth finished brass or a highly-polished copper shade with a matt textured cast iron base. Available as a wall, floor or table version. This Modern Lamp has the hability to combine with every room of your home, your bedroom, your dining room or your living room. It’s also a perfect example of lighting design. This was the Modern Floor Lamp that we’ve choose for you today, the best one for your modern home decor, don’t you think?